Show that you can take a hit and bounce back! Wear a Go For Broke patch! Injuries happen - riding, racing, rock climbing, roller derby...participating in any activity that you enjoy. Simply place a patch at the location of each break or fracture. Or, stack them up on your gear bag or favorite jacket. Go For Broke patches make great gifts, for your friends and teammates. Pick one up to help a friend heal! Tell a story with your Go For Broke! patch - let folks know that you've been there too! Go For Broke! Go For Broke! are high-quality, cloth-backed, woven patches. 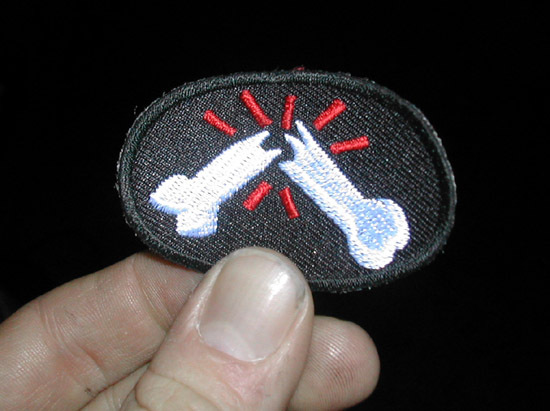 Patches are approximately one inch high and two inches wide. The patches have an iron-on backing, but for maximum durability we recommend sewing them on to your gear. Patrick Leyshock thought up the idea for Go For Broke! while laid up with a broken collarbone after an incident during a 2001 practice session at Portland International Raceway. Inspired in part both by Dave Aldana's famous "skeleton" leathers and the tally marks found on the sides of combat aircraft, he began working with local vendors to make his idea reality. The "broken bone" patch has since become a recognized icon worldwide - an icon worn proudly by folks who aren't afraid to take risks. Order your Go For Broke! patch today - we ship worldwide! Patches are $5.00 each (1-5 patches) or $4.50 each (6 or more). Prices include shipping worldwide. Shipping is by U.S. Mail (including international shipments). Rush shipping is not available. UK and European customers: you can order from Sideburn's webshop! There's always the mail, too. If you'd prefer mailing a check or money order, please drop a line to ngkbr8es@gmail.com for details.